How I Bookstagram + How YOU Can Too! hello everyone. it's nova... back from the dead with some amazing tips on how to bookstagram. i'm going to be covering all the basics, information you may have seen on others' bookstagram tips videos and posts. however, i'm going to be doing something i think is interesting. i'm quite literally, going to walk you through the process of how i take a photo that does [and is!] appear on my bookstagram. - my bookstagram is here. - yes, i realize i don't have a theme but for me, themes limit me to a certain color scheme or idea so i prefer to be... themeless without theme. 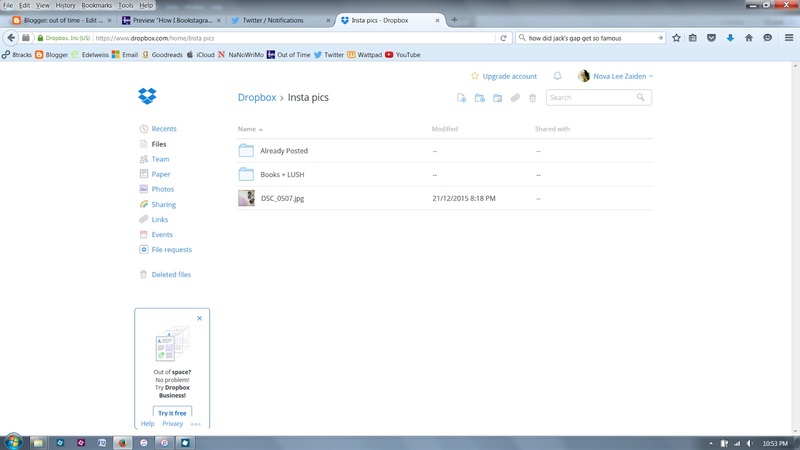 - to get my pictures from my laptop to my phone [to post] i use dropbox. thanks so much to xan for showing me how to do this! she has a bookstagram "how to" here. photo editing tools - optional but recommended [this is where you fix weird lighting and add fun filters that separate your pics from others! an idea? i find that life is a lot easier when you have a vision of what you want to do. it could be something like "sea of books" or something like "i want the flowers over here, the books there and the sun to be hitting right on that title so it glows." just the idea of trying to roll with a shot without artistic vision makes your life a lot harder. i wouldn't say it's impossible. there have been lots of times where i went into the forest with a bag full of books going, "okay, i'll find my artistic design in there." props? what bookstagram picture doesn't have some kind of prop? but don't mistake props as limited to fairy lights or fake flowers. once, i used forks and spoons as a prop, cupcakes, my dad's car, candles and even my sweater. it's all about your vision - see everything goes back to that freaking vision. photo editing tools? you are most likely going to want to edit your photos after taking them. you can do this two ways: photoshop or an app. fortunately for you, i use both. patience? by far the most important thing. so many times, i've heard people say that bookstagram is easy and sorry guys, going to have to laugh in your faces here. bookstagram is not easy. i'm about to walk you through the effort it takes to post one picture to instagram. have patience in your ability to make beautiful art but also have patience because you're going to end up quitting before you start if you walk in with the wrong ideas about this. vision— i wanted to create a series known as #lushandbookstatography. 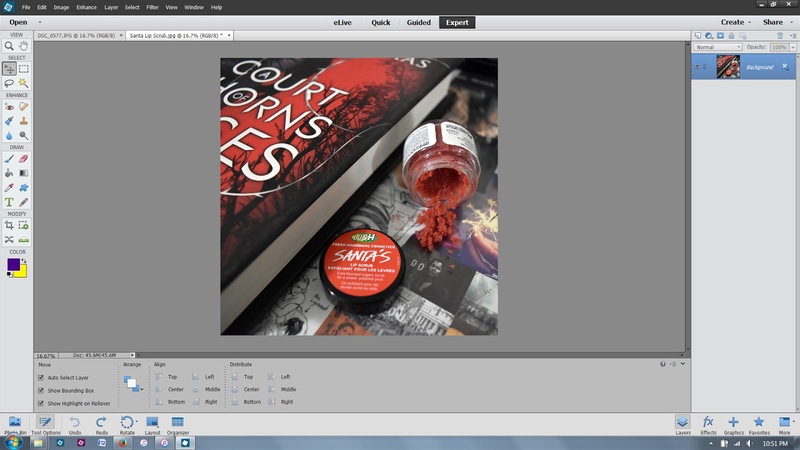 as part of that series, i wanted to pair my lush lip scrub with a book of the same color scheme. that led me to pick the book, "a court of thorns and roses." so what do i have so far? i'm going to use acotar and it's going to have that lush product. everything else was up in the air and took forever to get right. the most obvious thing people tend to do when taking pictures is to do a generic one with nothing interesting. i'm going to be honest - i would never take a picture like this now but in the beginning: definitely. after i'd taken this picture, i was like "oh this is all wrong" and that critical sense in any artistic person is key. you need to be able to tell yourself that what you've created isn't good enough just like you need to be able to sense when something is amazing. for me, i realized that this was the worst. so the biggest problem here? the angle. as in, there is none. this angle doesn't compliment the picture or the prop. it makes the entire space look empty. also, just saying: this shot is taken with a _____$ camera and it still looks like crap so imma say it again, it's about the technique, not necessarily the equipment. ahhh! slightly better. now, we got some blurring happening where the product is the main thing and the title is background. bookstagram is all about experimentation so i was like, "can i use some flash to fix this awful lighting situation?" and hahah, no. the real way to fix lighting is in photo editing. but that's later. flash is hard to work with indoors and obviously, i'm not at that stage yet so i'm going to stay away from that for now. by this point, i've realized that this "white sheet" thing is not working and i do not like it. this trend is on bookstagrams a lot, most/all of which are successful and artsy bookstagrams because it's a very monochrome and modern style which can look amazing or disastrous. it also heavily depends on the person. if you know me, you would know that my hair is a blue turning to purple. someone like me with a feed like this? no way! work with what you want to - don't follow trends. it won't work out for you in the long run. some more experimentation in which i try to find a better background. this is in a shelf and while the angles are disgusting, the point of this shot is not serious. i'm trying to find out if the colors work out with the coloring on my shelf and heck no. honestly, this bookshelf is super gross and i hope i can get a new one soon! let's also not talk about that dirt on the freaking wood. gross. this is a background that's good because i don't have much going on with the book and the tiny product so the background almost acts like a prop on its own. by this stage, i work on angles, starting with a straight one like this. you may recognize this position? it's the exact same as on the white sheet, but let me ask you: which picture do you prefer? which looks better? [let's pretend this one is actually in focus - whoops! sorry about that.] however, take a look again: side by side. now, doesn't the background make all the difference? this is what the final photo looks like before any editing. the lighting in my room is terrible [i have a ceiling fan with the light at the middle of the room so it's very uneven.] really, you should know your space if possible. by that, i mean, know what you sort of have to edit. for me, i know i'm always going to have to make it brighter and take out the warmth [take out the orangey tones] because my room is super orange and it looks obnoxious in pictures. this is what the photo looks like after retouching. i raise the brightness [by a lot!] and add some more saturation because i feel like the white washes out the color, plus there wasn't much to begin with. this takes some learning on photoshop [you can probably find some tutorials on google] or you can do this on an app. i prefer photoshop. sending it to my phone + going to instagram! my biggest problem was the conversion of laptop photos to my phone. things like instagram, twitter and email like to reduce my quality when i use them to send my images back and forth. it's awful. like what's the point of a good camera with the qualiy reduction? which is why i now use dropbox. you take the laptop file, upload to dropbox and download it on the phone. real easy. when it's on my phone, this is where filters come in. i don't like instagram's filters. i feel like it reduces the quality of the pictures because their filters are so unflattering to the pictures. i don't even know why they offer those filters. sorry for the mini rant, haha. the free editing app to use is vsco cam but me, i prefer to use afterlight. afterlight on a nexus is pretty terrible [i think there are less options than on apple] but the particular filter i use is on afterlight. unlike some people, i try to use the same filter on all pictures but my filter is weird around pictures that have a lot of orange or beige [not the best filters for selfies, unfortunately] so it's about discretion. basically, use filters wisely to make your pictures go from dull to... not dull. wooow, i am bad with words. in the end, after i play with filters and do some more adjustments [sometimes, i'll change the brightness, contrast, exposure and temperature because my filter doesn't compliment warm temperatures properly] to compliment the filter, i'll take a look and then post! fun fact: for every bookstagram photo i post, there are thirty similar shots that weren't picked and got deleted. this post is meant to show you the different shots i do to get the best results. the point i want to get across is that bookstagram takes a lot of effort but it's worth it. and honestly, all of us start out awkward and mediocre and we grow as we continue. 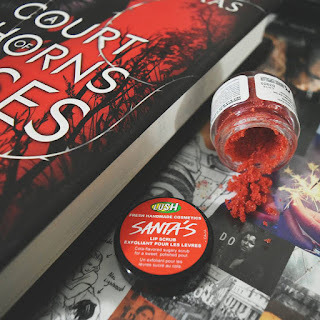 this isn't really a post that helps with the whole "how you can bookstagram" because i wanted to be different. i'm hoping something that i do can inspire you if you have no idea what to do yourself. spot the difference? i was far too lazy to do eyeliner so i photoshopped it on. and yes! 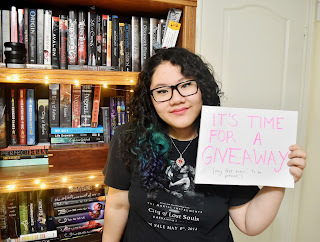 shameless self promo but you can enter my giveaway! click hereeeee! now go out there and fill that canvas. Patience <-- YES! And sometimes the right image just doesn't click for a while. Today I was trying to take a picture of A Darker Shade of Magic and tried to do a levitating book trick -- it didn't work AT ALL. And then a few hours later I saw my ADSOM art cards, remembered the cupcakes in the fridge, and immediately knew how to do it! PS: Your eyeliner photoshopping skills are the best. THIS HELPED SO MUCH! I have been playing with the idea of starting a bookstagram, but I had no clue how to go about accomplishing it. 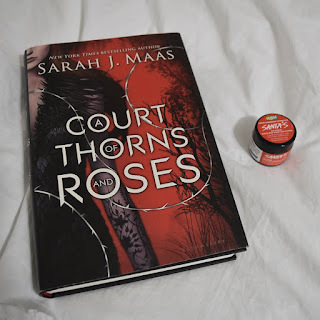 Before I started doing a little bit of research into Instagram (yep, I am that much of a nerd), I did not realize how difficult maintaining a bookstagram account really is. Amazing photographers, such as yourself, make it seem so easy! Thanks so much for the insight into your creative process. I feel a lot more confident about starting my own now! This is so helpful! It sounds like we've been on bookstagram for around the same time, and to be honest, I only found a way that works for me until quite recently. The lighting in my room is horrible, but I've spent AGES to try and get the right filter which makes it look brighter. The thing I'm stuck with is props! I find it super hard to get the right props to match the books - it doesn't help that I don't have many! My favourites to use are my art supplies, because they look good with so many books. I want to start a bookstagram so thanks for the tips. Can't wait to start doing it. Ooh, I LOVED seeing your process!! (And that final ACTOAR photo was. amazing. XD) Hehe My process is probably pretty similar, actually!! Except I DIIIIE at trying to get them onto my iPod. I don't have an iPhone and my iPod 4th gen refuses updates and cool apps and good quality photos. *cries* SO I DO WHAT I CAN. Omg editing skills are THE BEST. Just sayin'. Your pictures are the best! I am by far not a great photographer, I understand almost nothing of it. I recently started getting into trying some bookish pictures, and it is convenient that this post popped up! I have not patience, and I think that is where my problem lies with all of this stuff. I am definitely going to come back to this post in the future for reference. 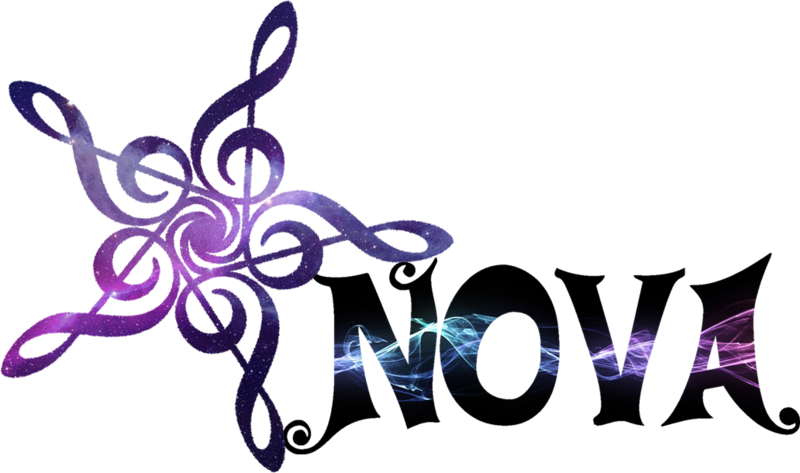 Thanks for the help Nova! Wow, this is awesome! I have been told many times I should do this too, and I love seeing the photo-editing processes people go through as such. Unfortunately, I don't have a phone, and the app on my laptop is broken, so no bookstagramming for me. :( :( Still, thanks for sharing your method—in the event that I need to learn, I know where to go. This is awesome. I have a bit of different process but this is really great advices. I just started really trying to grow my Instagram account. I've just started an account @_queenofthebooks_ and this is going to help a lot thanks!